Because we have a schedule that requires spreadsheets to manage, having dinner items ready to go in the freezer is not just a luxury; it’s a must. I know I’ve mentioned my fickle feelings for freezer cooking, before, so this won’t come as a surprise, but I must revisit the subject just briefly. I’m not a big believer in casseroles assembled and deep-frozen for later thawing and heating. My version of stocking the freezer is to put fully-cooked components that can be combined in different ways to keep things from feeling like drudgery. There’s no “Sorry, Johnny… we’re going to eat pease porridge for the tenth night in a row” in my house mainly because I’m the badly behaved child who would sulk at the idea. 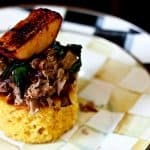 Two of the most popular foods in our home using this method are Slow Cooker Cola Pulled Pork and Habanero Buttermilk Cornbread. Pulled pork and cornbread are, all by themselves, wonderful, but the possibilities for making them new over and over are nearly endless! Put pulled pork on pizza, in sandwiches, on rice bowls, and in soup, just to name a few. Eat cornbread with soup, chili, or in dressing. Now… when stars collide and you have cornbread AND pulled pork, you can pull together a dish that looks tres chi-chi and takes mere moments and some easily sourced ingredients: Pulled Pork Habanero Cornbread Stacks. That’s right. 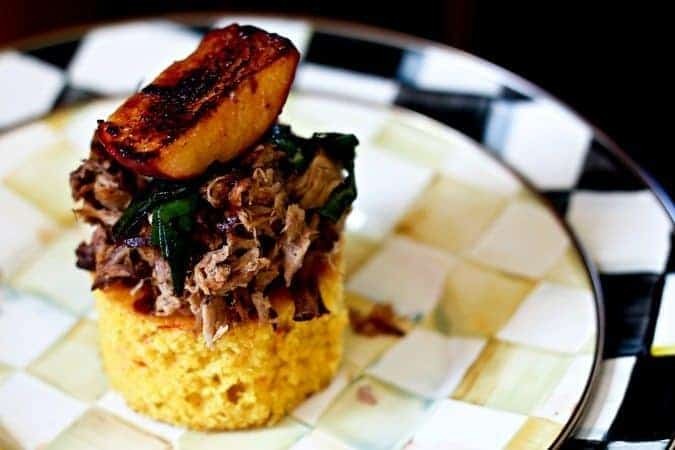 Go whole hog (PORK PUN ALERT) with spicy cornbread stacked high with pulled pork and topped with sautéed collard greens and a griddled peach or apple like in today’s recipe. If that doesn’t make you want to sing, I don’t know what will! Can you imagine busting this out at your next party? Guess who’s going to look like a fancy-pants chef? YOU ARE. It’s no namby-pamby, frou-frou dish, though. Sure, it’s pretty, but it’s also hearty, stick-to-your-ribs fare that’ll please even the most hidebound meat and taters audience you have in your company. How can anyone say no to pulled pork and cornbread? Of course, if you have tender-mouths you’re feeding, you can omit the habanero peppers from the cornbread, but a little zip goes so nicely with the pulled pork, collards, and fruit. I prefer peaches for this dish, but a good one is nearly impossible to find in New York State in January, so I often substitute firm, tart apples. It’s an entirely different but equally delicious experience. Use what you like here! Either way, though, please keep the skin on the fruit when you cut it up. It will help the fruit keep its shape after being fried which makes it purdier after cooking. Go whole hog with spicy cornbread stacked high with pulled pork and topped with sautéed collard greens and a griddled peach or apple. This is tailor made for entertaining whether it's an elegant dinner soirée or a game day party! 3 cups pulled pork Slow-Cooker Cola Pulled Pork or Slow Cooker Cuban Pork are nice choices. Any good pulled pork will do! 4 large wedges or slices of peach or apple when in season or when you can find a good one, cut away from the core. Either way, leave the peel intact! In a large mixing bowl, whisk together all of the dry ingredients. In a separate bowl, whisk together the wet ingredients with the minced habanero pepper. Pour the wet ingredients into the dry ingredients and use a whisk to gently combine them, ensuring there are no dry pockets of cornmeal. 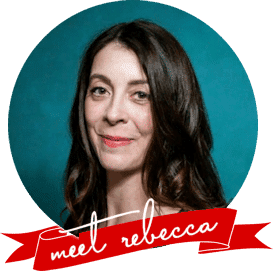 Pour into a generously greased 8-inch or 10-inch cast iron skillet, preferably, or an 8-inch by 8-inch square cake pan, or 8-inch round cake pan. Pour the cornbread batter into the greased pan and bake for about 30 minutes, or until a skewer or toothpick inserted in the center comes out clean. Serve warm for best flavour. Leftovers can be stored -wrapped in a towel or plastic wrap- at room temperature for up to 48 hours, but will taste best if reheated slightly before serving. Cover the rounds lightly with plastic wrap while you prepare the pork, collards and fruit topping. Heat a heavy-bottomed frying pan over medium heat. Add the pulled pork to the pan and cover along with 1 tablespoon of water and cover with a tight fitting lid. After 2 minutes, lift the lid, flip the pork with a spatula, replace the lid and heat for another minute or until the pork is heated all the way through. Transfer to a bowl and return the pan to the burner, raising the heat to medium high. Drizzle 2 teaspoons of olive oil in the pan and swirl to coat. Add the collards to the pan with a generous pinch of salt and stir-fry until bright green, and tender but still toothsome. Transfer the collards to a bowl, tent with foil, and again return the pan to the burner, leaving the heat at medium high. Melt 2 tablespoons butter in the pan. Sprinkle the cut side of the peach or apple with raw sugar and place, sugared side down in the melted butter. Let them fry without moving them around, until the sugar has caramelized. Flip the fruit over and let them continue cooking until fork tender. Divide the pulled pork into 6 portions and pile each portion on top of a cornbread round. Divide the collards between the stacks and top each pulled pork and cornbread stack with one piece of fruit. Serve while still warm. Ohhhhh dear heavens… my husband loves habanero, so this is definitely happening! Scrumdiddlyumptious! 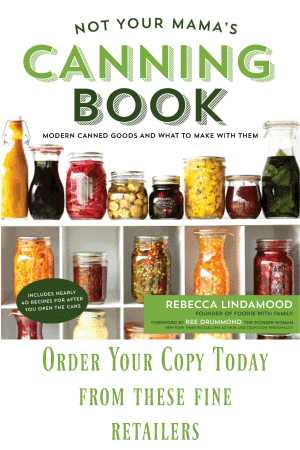 I’m coming over – looks amazing! I’ll plough the driveway for you! This looks right up our alley. I call my frozen treasures like pulled pork ‘building blocks’, things to build a meal with. And now, a reason to pull out some pulled pork! Oh my goodness. These stacks!!! Incredible and delicious! What temp do you bake the cornbread? Sorry, I’m sure it’s there somewhere and I’m just missing it. It’s in the works as we speak (minus the habanero sad to say)in my new 8 in cast iron skillet! Thank you!! Oh boy. I’m at work right now and I’m so wishing I could have some of these! Looks so good. Pulled pork on corn bread?! Wake me from this dream! Hi… how many servings in this recipe????? Making it for xmas dinner!! Hi… how many servings in this recipe?? I’m feeding 20 ppl and want this as my appetizer. Thanks!